Bearded dragons are wild animals native to Australia. The dragons have since been domesticated and raised successfully as pets throughout the world. They typically reach an adult size of between 13 and 24 inches long and have a chameleon-like ability to change colors when upset. 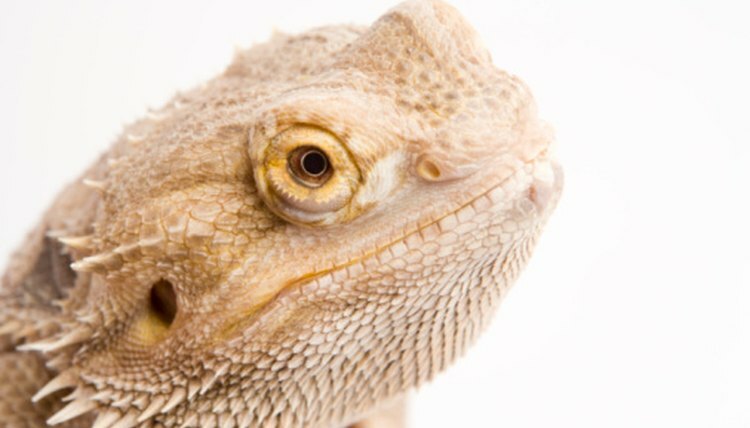 Bearded Dragons will often become anorexic when constipated, stressed, depressed or generally unwell. If your pet begins to show signs of dehydration or malnourishment, it may become necessary for you to force feed your dragon until he can be treated and resume a normal feeding pattern. Fill a small syringe with a puree of dragon diet. In the puree include vegetables, fruit, worms for protein and a liquid vitamin supplement. Apply pressure to the sides of the bearded dragon’s mouth to force it to open. Use your thumb and fore finger. Slide your fingers about three centimeters back from the top of the nose and apply pressure to the crease between the upper and lower jaw. The pressure should force the lizard to open his mouth. Stick the small syringe into the opening as soon as the dragon opens his mouth. It is important to be quick or he will close his mouth before you get the syringe into position. Slide the syringe down along the side of his mouth until the tip is against the back of your pet's throat. Push the depressor down slowly. Give the pet time to swallow. You do not want to choke him or force him to aspirate the food. Point the tip down toward his tongue, not up toward the roof of his mouth. Feed about one tablespoon of the puree at a time. If your pet is showing signs of dehydration, submerge his body in warm water. He will absorb water through his skin and maintain his health longer. If you are force feeding your dragon, then there is a problem. Take him to his veterinarian as soon as possible. Force feed your dragon only as a last resort. It is traumatic for the reptile and can stall his social development.